The first time I was aware of a song I heard on the radio being different from the one I bought in the shop was in 1977 after purchasing a copy of Peaches by the Stranglers and playing at home and thinking this isn’t the same as Radio 1 played. For those not familiar with the song, it has three words which the BBC deemed unfit for radio play and so a special version was recorded by the band. The second time I noticed a difference between the radio and a commercial version was a couple of years later when I heard Kid Jensen play Sultans of Swing which instantly loved and rushed out to buy only to find it was about a minute and 10 seconds longer. The radio version had a whole verse removed. Criminal! Dire Straits’ roots were covered in the story of Romeo and Juliet 11 weeks ago, but it was this song that got them on the road to fame and it was all thanks to one man. Mark Knopfler, Dire Straits’ lead singer and guitarist had stuck five demo songs onto a cassette and punted them around to little effect. A copy of that tape found its way to BBC Radio London DJ Charlie Gillett who played it on his show and within a week a number of record labels were locked in a bidding war for them. The song tells the story of a swing band performing in a smoky club where most of the musicians had full time jobs and just play together for fun. That may well have been the case for the band that actually inspired Mark to pen this real life story with many hidden clues. The Dixie double four time was a reference to the style the band were playing which was made popular by Les Paul in his early days and also Django Reinhardt. The line ‘now you step inside but you don’t see too many faces’ describes the lack of people in attendance at the time. Deptford is about a mile away from Greenwich which is relevant as the second line, ‘It’s raining in the park but meantime’ is referring to Greenwich Park and meantime being where the original Royal Observatory was based – hence Greenwich Mean Time. The line ‘competition in other places’ was pointing out three local Greenwich pubs, the Coach and Horses, the Spanish Galleon and the Admiral Hardy which were all providing entertainment at the time and are all still there today. The third verse of the song namechecks firstly ‘Guitar’ George and then Harry, who didn’t mind if he didn’t make the scene, there have been claims, even in Q magazine in 1996, that it was George Borowski, it isn’t. It’s true there is a guitarist called George Borowski and by his own admission, “I know a lot of chords, but I am not the one mentioned in Sultans of Swing.” Borowski was playing in a venue in Manchester once and even announced before the show started, “If anyone is here because they think I’m the George in the Dire Straits song, I’m not.” Apparently no one left. The George and Harry are George Young and Harry Vander two members of the Australian group The Easybeats. Young was actually born in Glasgow (same city as Knopfler) but emigrated with his family to Australia when he was 15. Young was the rhythm guitarist and Vander was on lead. Young later moved into production most notably with AC/DC which featured his younger brothers Malcolm and Angus. In the radio edited version, the verse which begins with ‘And a crowd of young boys, they’re fooling around in the corner’ is completely omitted but the one small addition to the radio edit is, after the instrumental break there is the addition of ‘thank you’ after the word goodnight. This is probably taken from one of the earlier single releases prior to it being a hit. 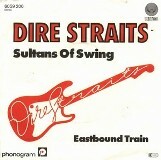 Sultans of Swing was the first of 18 hit singles the band enjoyed, their highest chart placings being with Private Investigations and Walk of Life which both reached number two in 1982 and 1986 respectively. Far and away their most successful album was 1985’s Brothers in Arms which, with the help of being one of the first every albums released in the CD format, has sold over 30 million copies worldwide. The band split in 1988 and reformed 1991-1995 after which time Mark has launched a solo career and has collaborated with many fine musicians like Eric Clapton, Emmylou Harris, Chet Atkins, Bob Dylan, Elton John, Bryan Ferry, Van Morrison and James Taylor. He has also produced albums for Bob Dylan, Randy Newman and Tina Turner. Mark’s latest album, Tracker, was released in March 2015 and reached number three. This is the radio edited version with ‘thank you’ in.